We have a wonderful of diversity of orchid species ready to share with visitors to the British Orchid Show and Congress next week. 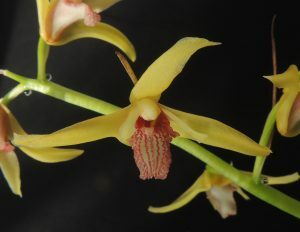 We only have one genus of orchids beginning with X and that is Xylobium. Xylobium is a genus of terrestrial and epiphytic orchids from South and Central America and we saw one species in Brazil on our expeditions there. Xylobium subintegrum is a cool growing epiphyte from Ecuador and Peru where it grows in cool wet forest from 1700 to 2000m altitude. It is a robust plant with large pseudobulbs and thick large leaves. 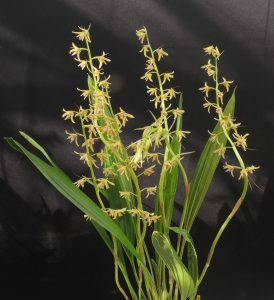 In late summer the new pseudobulbs produce a number of 50cm long flower spikes each with ten to twenty attractive flowers and prominent bracts. The spikes are a little unruly but we resist the urge to stake them as they look very attractive against the leaves without canes to spoil the effect.